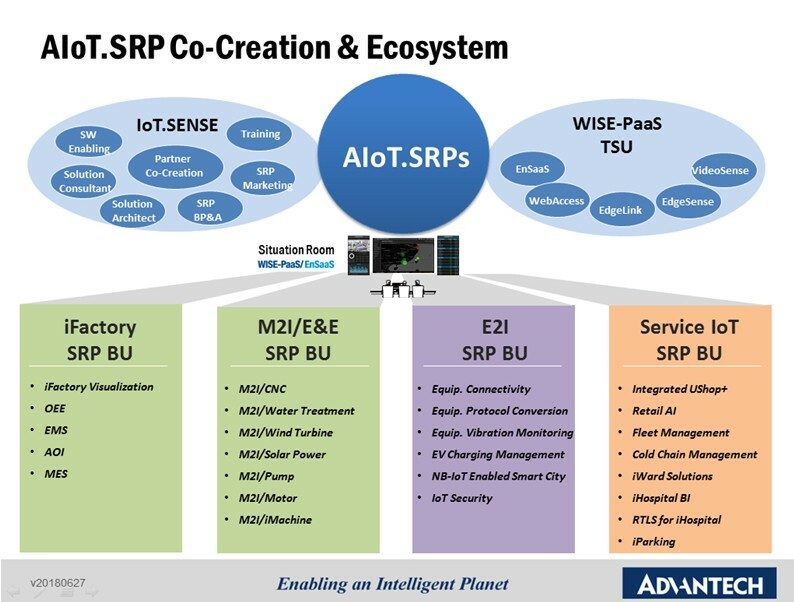 Advantech, the world’s leading brand in intelligent systems (stock symbol: 2395), has announced the co-creation of IoT Solution Ready Packages (SRPs), which has involved co-creating with various domestic and international companies. Thirty sets of SRPs will be officially released this year, and Advantech will hold the 6,000-participant IoT Co-Creation Summit and AIoT.SRP press conference on November 1 and 2 in Suzhou, China. K.C. Liu, Chairman of Advantech, pointed out that industrial IoT (IIoT) applications are about to become widely implemented in various industries. However, the key to success lies within platform technology suppliers, such as Advantech, as well as in working closely with industry professionals to integrate and form standardized and easily duplicated SRPs based on a combination of software and hardware products. These SRPs can then be installed by system integrators at the client site. Eventually, IIoT industry chains will be formed as SRPs become established as comprehensive field solutions. Therefore, the IoT industry chain must include sensors, edge computing, communication, PaaS (Platform as a Service), industry SRP, and cloud services. For the next five years, this type of industry chain is projected to reach maturation at an accelerated pace. Additional SRPs co-created with professional enterprises from China and other regions in the world will be announced separately. For Advantech’s IoT Co-Creation Summit on November 1 and 2, 6,000 senior executives from the world’s IoT domains have been invited to exchange and share their ideas. The event will include 100 in-depth discussion seminars focused on IoT-related topics, IoT solutions (AIoT.SRPs) announcements with 30 different partners from various industries, and innovative applications co-created by 50 partners from key industry domains, bringing new ideas related to IIoT and smart city industries. The event is expected to have a major impact and to totally revolutionize the future of related industries. According to Dr. Allan Yang, Advantech’s Chief Technology Officer, IIoT solutions must be able to integrate the collection of industrial equipment data based on a variety of standards with edge device management, wireless communication, and data analysis. Such solutions must also integrate the creation of visually intuitive reports on cloud platforms as well as the creation of AI models and their integration with expert knowledge. Other key areas include compliance with data storage location and management regulations established by each country/corporate policy and the construction of stringent and trustworthy platforms and data security mechanisms. Since the professional technologies and knowledge required must come from different domains, the co-creation model is truly an effective and mutually beneficial model for realizing these outcomes. With respect to the multifaceted and complex requirements of the IIoT solutions mentioned above, Advantech uses a data-driven architecture incorporated with cloud platform service technologies as its core to create the WISE-PaaS industrial cloud platform. The platform can move across multiple clouds and it offers flexible expansion, multitenancy, superior reliability, multiple database services, AI model training and deployment framework services, visualization services for dashboards, and multi-level data security/management services. With the WISE-PaaS platform providing a foundation, Advantech and its co-creation partners will work together to rapidly deploy a range of IIoT solutions. By merging with the innovative industrial cloud service business model, the third wave of the digital revolution has officially kicked off to successfully transform our industries.